1868-1885 St Cuthbert's and Canongate Poor House. St Cuthberts Poorhouse (with its typical clock tower) was opened on the 21st December 1868. This map shows the location of the Poorhouse as it was in a diagram dated 1868. 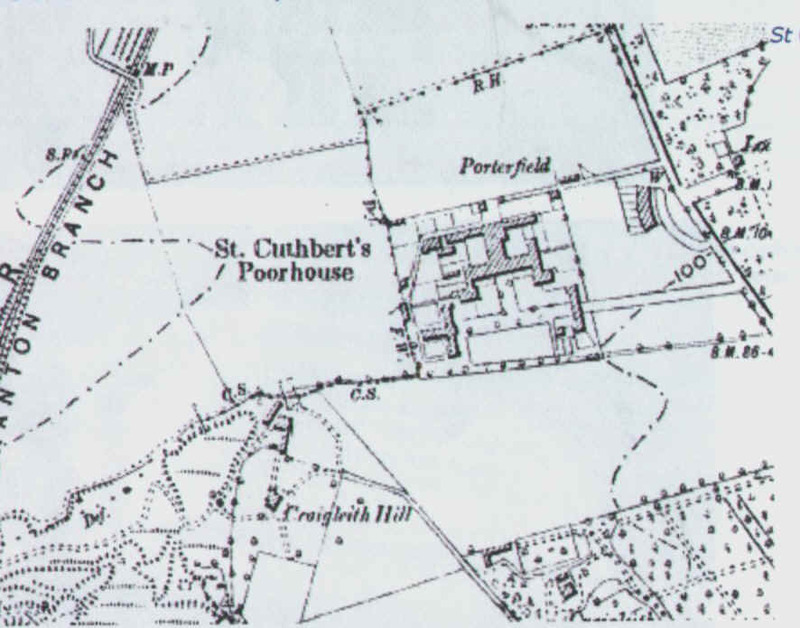 This shows the extensive buildings (Craigleith Sandstone is reported to have been used in the construction) that were described as St Cuthberts Poorhouse surrounded in those days with wide open spaces. The ground was acquired from the Fettes Trustees and consisted of ten acres of farmland at Porterfield, Craigleith. The roadway up to the present Outpatients is still called Porterfied Road. Notice the curved row of houses, Moredun Crescent, between the Poorhouse and the West side entrance to Fettes. The row of houses was believed to have been built to stop the "Fettes Boys" from "seeing into" the Poorhouse. The name Moredun is a bit confusing as Moredun district is better known on the South side of Edinburgh. On the 1st February 1968. it was renamed Carrington Crescent after Lord Carrington Governor of New Zealand 1885-1890 who was connected to Fettes College. 1914-1918 2nd Scottish General Hospital Craigleith. Craigleith Poor Law Hospital Intermittently in various reports. Craigleith Hospital Intermittently in various reports. 1912 Childrens Hospital and smaller building next to it built. Both red brick similar to Nurses Home. 1935 Gatehouse modified to allow ambulances to enter. 1937 Recreation Hall started to be built. Demolished in 1994. 1938 Reconstruction of Hospital deferred. 1938 new boiler house was built. 1939/45 Childrens Hospital became the Paderewski Hospital for Polish combatants and civilians. Paderewski was a Polish National hero and world famous pianist. 1950 Paderewski Hospital becomes the casualty and OP department. Building surrounded by trees bottom right in photo below. 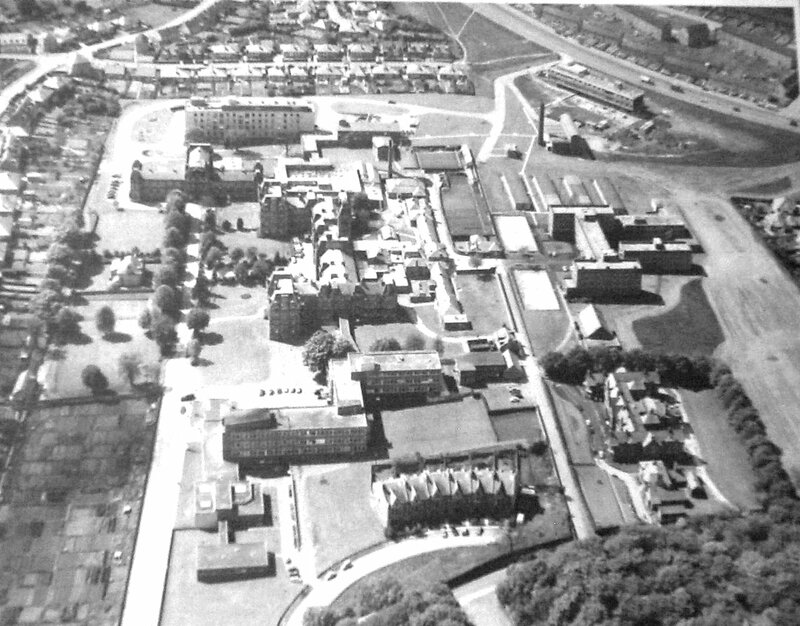 1952/56 Radiotherapy Unit and related wards built. 1952/60 Surgical Neurology Unit built. Large four storey building in front of the Crescent in photo below. 1959 Central Microbiological Unit built. Long building at the back entrance onto Telford Road. See photo below. Can you find the original boiler house and chimney and then the second boiler house and chimney? The third boiler house and concrete chimney is to be built in the space top right of photo above just below Telford Road. 1964 Kidney Transplant Unit built. Bottom centre of photo above showing bridge from Transplant Unit into Radiotherapy Unit. 1966 Boiler House (No.3) and Laundry with concrete chimney built demolished and rebuilt. Just out of shot at top of photo above. Can just make out laundry wall and to its right and down is what remains of Boiler house No.2. 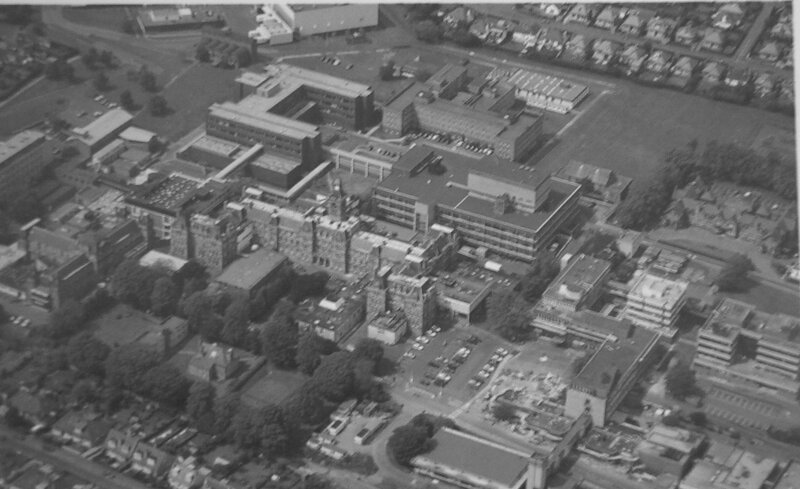 1966/68 Outpatient Casualty and Diagnostic block built Large rectangular building just off centre in photo above. 1968 Human Genetic Building (1st building) built. Whitish four storey building second in from right centre of photo above. 1969 Scottish Health Centre for research into Hospital design built. 1969 Haematology/Biochemistry Laboratories built on ground in front of clock tower. 1970/72 Human Genetics Block 2nd building built. Carrington Crescent buildings demolished to make way for it. 1974 Extension to Scottish Health Centre built. 1980 Medical Oncology Unit (prefab) erected. 1988 Alexander Donald Building built. Large H building to left centre of photo below. Infectious Diseases Unit Built to the left of the Alexander Donald Building. Top left of photo above. Molecular Medicine: Built into space middle right side of photo just in front of Paderewski building. Anne Ferguson Building: The main access point to many of the WGH Out Patient Dept clinics as well as other wards. This was built on the site of Nurses home and small recreational hall. ICRF Building: Built into space bottom right where the car park spaces are marked out!!!! The Hospital has doubled if not trebled the space it originally was built on. It has reportedly something like 3,500 staff working on site which includes Hospital as well as Research Laboratories. Car parking is at a premium in the grounds and is difficult to find a space. The surrounding districts residential areas were once used for car parking but unfortunately this was done indiscriminately and lead to the introduction of single yellow lines and then a Controlled Parking Zone. The present fee for parking in this controlled area is £1 per hour for a maximum of four hours only. The WGH still has problems with car parking. Building of a two tier car park is now complete but the increase in car spaces only compensated for the loss of car parking now that the replacement for the Royal Victoria Hospital has started to be built on the site of the Paderowski Hospital and its car park.